Anne coordinates the Nurture Ministry Unit working with the Congregational Care, Evangelism and New Member Welcoming Committees. Working with the Christian Formation Ministry unit, Anne visions, designs and helps to implement and evaluate Baptismal Buddies and Confirmation Ministry. 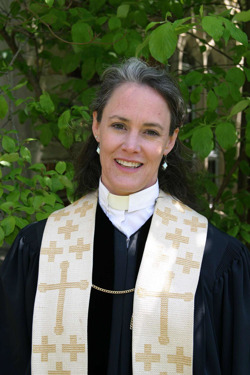 She also serves on the board of the Montreat Conference Center in North Carolina. As a teacher and pray-er, connector, collaborator and preacher, Anne is a patient listener who loves dreaming up a good meal and calling people together around a table; as well as delighting in the solitary work of writing, disappearing into a good book or poem. She also enjoys gathering a group of folks to get out in nature and encouraging movement in the beauty of creation, all the while reflecting on God's good abundance. Anne is a marathon runner, avid reader and writer who loves to live life to the fullest. She is married to Jim, who works with The Sterling Group as a Managing Director, and together they parent two young adult children, Betsy, (married to Daniel Eldridge, living in Raleigh, NC) and James, living in Starkville, MS; and a high school student, Abigail. Before moving to Memphis, Anne served as Pastor of Grace Presbyterian Church in Mobile, Alabama. A graduate of Rhodes College and Columbia Theological Seminary, Anne has doctoral course work in instructional design from the University of South Alabama which guides and informs her ministry. Anne has served as an Adjunct at Memphis Theological Seminary and also serves on Presbytery and denominational committees. Anne can be reached at anneapple@idlewildchurch.org or 901-726-4681 ext. 218.